When your home is on wheels, it’s worryingly easy for someone to drive away with it. Malinda Crichton perches in the loft of the tiny home she is building. Malinda Crichton was faced with an unusual dilemma last week: she woke up, took her dogs out and saw that her house was missing. One of them, anyway. Crichton rents a cottage in West Sacramento, California, while she builds a 285-square-foot house, which she plans to live in once she finishes construction. The tiny home on wheels, which she keeps parked about 50 feet from the house she rents, wasn’t in its usual spot Tuesday morning. After its disappearance sunk in, Crichton called the police to report a missing home. Crichton also called the property managers for her rental to check that they hadn’t towed the house, asked neighbors if they had seen someone take it and called local news stations hoping to get the word out. Around noon, Crichton asked a man she knew who was driving by if he had seen anything, and it turned out he had seen her house parked a few miles away, behind some shops in a strip mall. She paid a towing company to bring it back, and in less than 24 hours after it was stolen, she had it back safe and sound ― and locked up more securely. West Sacramento Police Department Sgt. Roger Kinney said they do not have any leads, but investigators are looking into whether there’s security tape of the theft. “I’ve never seen anything like this,” Kinney said of the reported incident. Tiny homes can be built on foundations like a traditional house, or on wheels, like Crichton’s. 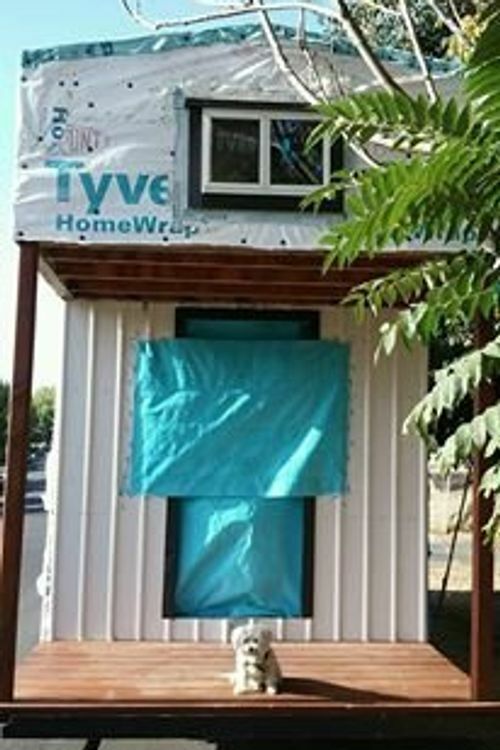 Though theft is rare, it has happened before ― in 2014, a San Antonio couple was almost done building their tiny home, also on wheels, when it was stolen. Fortunately, police found the home a few days later in someone’s driveway nearby. Having a home that could roll away presents unique security issues, but there are a variety of anti-theft devices: the blog Tiny House Talk offers security tips. There’s been a growing interest in building and living in tiny houses in the last few years. Crichton, a musician, was drawn to the idea of having a place to live that was paid off, so she could spend her time performing and traveling. Malinda Crichton’s dog Tilou sits on the porch of her tiny house. Crichton also said that building her home was good for her health, as she’s sensitive to chemical smells. With her initiative Healthy Tiny House, she hopes to help others who have similar issues with traditional construction and finishing materials access affordable tiny homes. She has been building her home for the last three years and hopes to have it partially complete and inhabitable by the end of the year. Crichton is still looking at options for where she’ll keep the house. With two lofts, a porch and room for a washing machine, she describes it as spacious. Crichton also hopes the rare threat of theft wouldn’t deter anyone else from tiny home living.